On Tuesday night, I attended a viewing of the documentary film, Refugee Kids, about an American program set up for refugee children. Run by the International Rescue Committee (founded by Albert Einstein to rescue Jewish refugees), the Refugee Youth Summer Academy transforms 120 kids speaking 26 languages from the world’s hot spots – Iraq, Egypt, West Africa, Tibet, Burma and Bhutan – from “tongue-tied newcomers into confident, savvy New Yorkers” over the course of the six-week program. We meet Helen, a 16-year-old Burmese refugee, who effortlessly translated from English to Burmese to Chin to Thai to Nepali. There is Tek Nath, who in his first six months in America, did more than most adults: He leased the family apartment, translated for the surgeons operating on his brother’s heart, applied for the family’s green cards, opened bank accounts, and tutored both parents and younger siblings in English – and all the while maintaining straight A’s in his school work. And this from a 17-year-old who had spent his entire life in a rural Nepalese refugee camp where he had virtually no English instruction. We meet George from Liberia who lost both parents at a very early age and was raised in Staten Island where he was confronted with the brutality of gang violence but has still emerged as a student mentor, exhibiting leadership skills. There are also the siblings who faced long separations from their families: Rigzin and Tashi from Tibet who are reunited with their parents in Brooklyn after eight years spent at the Dalai Lama’s refugee school in India; and Ida and Jennifer from Togo who were raised by their aunt and encountered an unforeseen family tragedy — fire and death of a young sister– upon their arrival in the Bronx. The directors, Renee Silverman and Peter Miller, added to their footage with interviews in the children’s homes and in their communities. The children narrated their often harrowing back stories in hand-drawn pictures, which were animated by the talented Brian O’Connell. Liz Swados, the beloved composer, recorded an original score before her untimely death. The editor Aaron Vega wove the many stories together into a cogent, short film as his last project before winning a seat as American state legislator where he now serves in the Massachusetts House of Representatives. As a student in college, Lev Golinkin confided in his professor that he had no future. No, the professor concurred, it’s worse, because he also had no past. As a 9-year-old refugee from the Ukraine, Golinkin had suppressed his cultural identity, both in order to assimilate and to erase a painful childhood in a region of the former Soviet Union where anti-Semitism was particularly virulent. He then realized that he had to reconcile his past with his present in order to determine his future, so he spent several years researching his family’s journey. When the Golinkin family fled their home, they knew only to go to a particular train station in Vienna. They knew no one and they had to rely on the kindness of strangers. Golinkin tracked down everyone who’d helped his family, including the non-Jewish woman who met them at the train station. He has high praise for two Jewish organizations— the Hebrew Immigrant Aid Society and the American Jewish Joint Distribution Committee— both known only by their acronyms in a foreign language. HIAS and JDC. 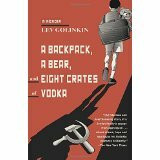 His research resulted in a memoir, A Backpack, A Bear, and Eight Crates of Vodka, and it is the choice for this year’s One Book, One Jewish Community project. In its ninth year, this is the largest event of this kind in the United States. He spoke at Gratz College on Sunday to a full auditorium. Golinkin still marvels at the expeditiousness of the Soviet Jewry exodus. 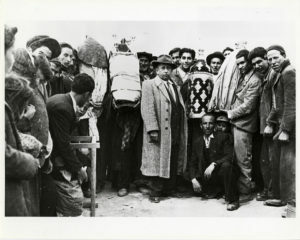 In latter months of 1989, compelled by rumors of an impending pogrom, 90,000 Jews fled the former Soviet Union. The next year, 100,000 Jews left their homeland. The Jewish communities of the United States and Israel mobilized to adopt (with legal obligations) and absorb all these people. We did it so well that it went under the radar for the general media and it was not a political football. Asked why did his family not go to Israel, Golinkin said that being estranged from the religious tradition, they had no compulsion to do so. They merely sought a place where there was a lesser chance of their home being hit by missiles. In choosing a college, he wanted a good one but without a Judaic Studies program. He chose Boston College, a Catholic Jesuit school, because it was known by its double adjectives, so he thought it was like “extra crispy”– Catholic, extra special. Then his conversation with his professor led to his Jewish awakening. Russian Jews are not known to affiliate with the Jewish establishment, either here or in Israel. This is in part the result of generations of intense anti-Semitism, such that little Lev thought being a Jew was only a disease, a burden on Russian society. However, his nephew is growing up a member of the American Jewish community, so he foresees progress for the second generation of immigrants. This is good news for all the individuals and organizations who’ve invested so much time and resources to rescuing the Jews from the former Soviet Union. Golinkin now feels most Jewish when he’s doing good with his hands, building houses and other kinds of community service. He speaks in public about immigration and he writes editorials about the current refugee crises. He’s most proud when Jews help non-Jews, as HIAS now helps to re-settle Syrian refugees. Judi Bernstein-Baker, Executive Director of HIAS-PA, was on hand to receive the new backpacks and stuffed animals collected at the event, and she told me that A Backpack, A Bear, and Eigth Crates of Vodka is the first narrative about the Soviet Jewry exodus from the point of view of the Russian émigrés. Finally, we get their perspective.